FREEWAY Bumpers team sponsor Nickleng Soto said she couldn’t have asked for a better New Year’s gift when her four sons featured in winning the annual NCD Governor Powes Parkop Cup and K8,000 winner’s cash prize. Soto said it was a proud moment to see sons Presley (20), Allan (19), Jonathan (18) and Felix (16) who featured prominently over the one-week rugby league carnival that brought together 32 teams from all the suburbs in the nation’s capital during the Christmas period. 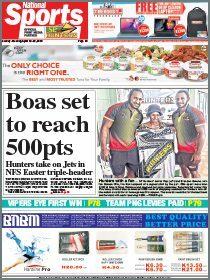 She said the win is just reward for her sons and the mixture of young men from Eka Kora Street, Hohola Three commitment to play good clean rugby against the best from all the suburbs in the city. “Nature is with me and big man antamp has given us this victory because we fought the hard way and were never considered a threat to winning the Cup,” she said. Skipper Presley Soto thanked the organizers headed by Billy Aki and NCD Governor Parkop for a well run competition and further challenged the other suburbs to come a get the title of them in the next tournament slated for Easter. Despite a slight hiccup in deciding the eventual winner, the Bumpers were finally awarded the 20-18 win over the 6-Mile Tigers after further deliberations between the referee, lines-men and organizers. Apart from the fact that a Morata team did not feature in the grand-final, Suburban League chief Billy Aki commended all teams for ensuring the competition was violence free and especially paid tribute to the supporters from 6-Mile, Erima and Hohola for turning out in huge numbers to the Kone Tigers Oval. Aki also confirmed that they will be cutting down the number of teams from each suburb to ensure they raise the level of competition. He also said that with players also being targeted for potential selection for future representative duties, he was buoyed by the talent shown during the Governors Cup. 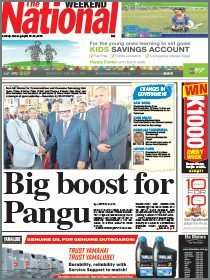 In the Plate, Dep Eels from Gerehu collected K3000 while runners-up Hohola 6 Knights K2000. In the Bowl, Ensisi Carpets claimed the K1,500 and runners-up Country Cowboys K1000.